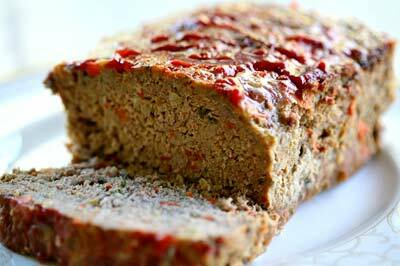 I would not do anything for love, but I might do even more for meatloaf. Nothing hits the spot like that down home favorite that brings family together and makes amazing sandwiches and paninis the next day. Preheat oven to 350°F and grease a loaf pan with non-stick cooking spray. MIx all ingredients by hand in a large bowl. Do not use a mixer, this will over-beat the meat. Pack mixture into a loaf pan, rounding the top. Remove from oven and let it sit for 5-10 minutes to cool. Serve it up and love it! For a little variety, feel free to add beans, shredded carrots and celery, peppers, etc. Just make sure it all fits into the loaf pan. If you have extra, lightly grease a cupcake pan and bake mini meatloaves in each cup. Top “ice” with mashed potatoes to make it look like a delicious meatloaf cupcake. I know you posted this awhile ago, but I’m loving your blog and reading the backlog! Have you been to The MeatLoaf Bakery in Chicago?! I saw it on a food show and wanted a meatloaf cupcake immediately!